The global sterilization services market is expected to witness significant growth attributed to growing need for uncontaminated equipment and devices in various industries. Inadequate cleaning of the medical devices will continue to propagate various diseases among the patients. As the need to cease contamination of various diseases remain high in the healthcare institutions, ruling authorities in various countries are imposing strict regulations regarding the adoption of sterile medical devices. In addition, the manufacturing and packaging companies are also focusing on meeting the specifications and requirements to maintain the sterility assessment level of the products. These factors are expected to impact growth of the global sterility services market positively. In addition, surge in demand for sterilization services in the packaging, food and beverage, cosmetic and pharmaceutical industries is expected to rev up sales of the sterilization services globally. As the need for sterilized devices and equipment continue to increase, government in various countries are imposing regulations regarding adopting medical instruments and devices that are verified as decontaminated. Moreover, strict assessment process of various medical devices by the FDA has further led the manufacturing and packaging companies in the healthcare industry to ensure implementation of the imperative specifications. Growing need to maintain the sterility assessment level (SAL) of the medical devices has also led the manufacturers to include decontamination as an important part of manufacturing in various industries. Conformance of the specifications recommended by the FDA will continue to rev up demand for the routine terminal sterilization. These factors are expected to impact growth of the global sterilization services market during the forecast period. In the next section, the global sterilization services market is segmented in terms of method type, end users, application, service type, and region. On the basis of method type, the global market is segmented as Physical Methods, Chemical Methods and Mechanical Methods. Based on end users, the global market is segmented as Hospitals & Clinics, Medical Devices Manufactures, Pharmaceuticals & Biotech Industry and Research and Academic Institutes. By application, the global market is segmented as Medical Devices, Laboratory Equipment, Packaging Materials and Raw Materials. On the basis of service type, the global market is segmented as Contract Services and Validation Services. By region, the global market is segmented as North America, Latin America, Europe, Japan, APEJ and MEA. Key players operating in the global sterilization services market are 3M Company, Solvay SA, E I Dupont DE Nemours & Company, Daikin Industries Ltd., Asahi Glass Co. Ltd., Honeywell International, Inc., Zeus Industrial Products Inc., Mexichem S.A.B. de C.V., The Chemours Company, Compagnie de Saint-Gobain SA (Saint Gobain Performance Plastics) and W L Gore & Associates, Inc.
Multiplying instances of hospital-acquired infections has significantly led to surge in demand for disinfectants in various industries. As healthcare institutions continue to remain a major source propagating infections and diseases, sales of the sterilization services is expected to remain high in the healthcare industry. Growing need for disinfecting equipment used in the food and beverages, packaging, pharmaceutical and cosmetic industry is further expected to contribute towards growth of the global sterilization services market during the forecast period. 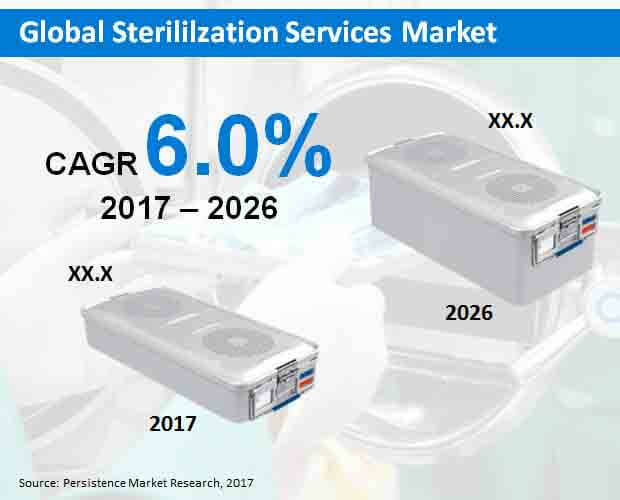 According to Persistence Market Research, the global sterilization services market is expected to represent a value of over US$ 3,800 Mn by the end of 2026. As the requirement of hygienisation and disinfected medical equipment is expected to remain high, manufacturing companies are increasingly offering single-use medical devices. Though, prevalence of various chronic diseases has led growing need for conducting surgeries and operations in various healthcare institutions. Inadequate cleaning of the medical devices can become a platform for the contaminated diseases to spread among other patients. Propagating various contaminated diseases through disease infected instruments has led the ruling authorities in various countries to impose regulations regarding application of sterile medical equipment. Moreover, stringent assessment of the medical devices by FDA is further propelling the manufacturers and healthcare institutions to opt for medical instruments tagged and verified as sterile equipment. Ultrasound probes, surgical instruments and endoscopes are some of the medical devices that are also reused in every other surgical operations conducted. Growing need for conducting surgeries with uncontaminated instruments is expected to impact growth of the global sterilization services market positively. Growing need to meet the requirements and specifications of uncontaminated medical devices has led the manufacturing companies to include routine terminal sterilization as an imperative process during production. As the manufacturers significantly need to maintain the sterility assurance level (SAL) as specified by the FDA, demand for terminal sterilization continues to remain high in the healthcare industry positively. Conformance to the specifications by FDA is expected to rev up demand for the sterilization services in the global market. Packaging companies will also continue to remain a major source of contamination for various equipment and devices manufactured. Growing need to eliminate and kill microorganisms contaminating the instruments and devices has led the packaging companies to opt for various sterilization services. In order to cease propagation and breeding of the contamination through the manufactured devices, packaging and other manufacturing firms are also collaborating with one-stop-shop sterilization service offering companies. Growing need to maintain sanitization and hygiene level to cease contamination in the packaging industry is expected to contribute towards growth of the global sterilization services market significantly. While uncontrolled spread of contaminants is fuelling demand for sterilization services in several industries, growth of the global market is expected to remain inhibited due to various factors. Chemical sterilants such as ethylene oxide are carcinogenic and has been known for causing bodily and respiratory distress. In addition, application of such chemical sterilants can hinder the operability of the electronic components embedded in the medical devices. In order to avoid the adverse impact of the chemical sterilants has led to the manufacturing, packaging and healthcare companies to opt for an alternative option such as chlorine dioxide and hydrogen peroxide. Bound to these factors, the global sterilization services market is expected to witness an inhibiting growth during the forecast period. Growing need for disinfecting medical waste and surgical instruments has led to increasing demand for physical techniques of sterilization. On the basis of method type, the physical methods segment is expected to represent a significant revenue growth, recording a value of over US$ 700 Mn by the end of 2026. In contrary, the mechanical method type segment is expected to register the highest CAGR throughout the forecast period. Based on end users, the medical devices manufacturers segment is expected to witness robust revenue growth, accounting for a value of over US$ 300 Mn by the end of 2017. However, the research and academic institute end users segment is expected to register a robust CAGR through 2026. By application, the medical devices segment is expected to generate significant revenues, recording a value of over US$ 680 Mn by the end of 2026. On the other hand, the raw materials application segment is expected to register a healthy CAGR during the forecast period. On the basis of service type, the contract services segment is expected to witness robust revenue growth, accounting for a value of over US$ 590 Mn by the end of 2017. However, the contract service type segment and the validation service type segment is expected to register a parallel CAGR throughout the forecast period. Leading market players operating in the global sterilization services market include E I Dupont DE Nemours & Company, Solvay SA, Asahi Glass Co. Ltd., 3M Company, Daikin Industries Ltd., Honeywell International, Inc., The Chemours Company, Mexichem S.A.B. de C.V., Compagnie de Saint-Gobain SA (Saint Gobain Performance Plastics), W L Gore & Associates, Inc. and Zeus Industrial Products Inc.